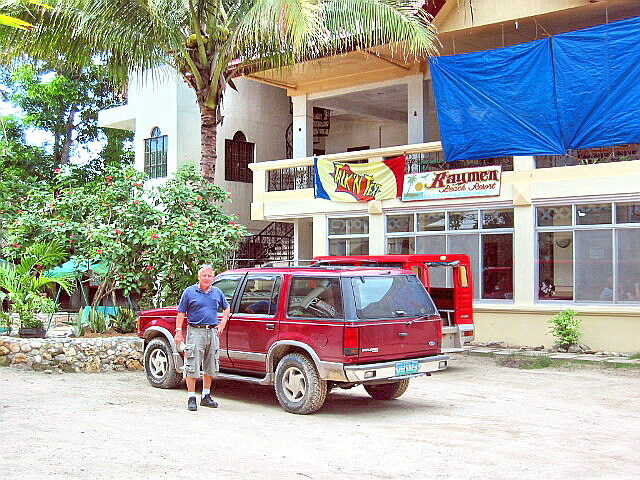 After breakfast at the Fine Rock Hotel, Charlie and I again boarded our Ford Explorer and drove to Muelle Loney (Iloilo River Wharf). Here, we loaded the car on the MV Felipe, another ancient RORO (Roll On Roll Off) ferry of F.F. Cruz Shipping Corp., bound for Jordan, the provincial capital of Guimaras, where we plan to do GPS mapping. This would be my second visit to this island province, having been there 10 years ago with my family. 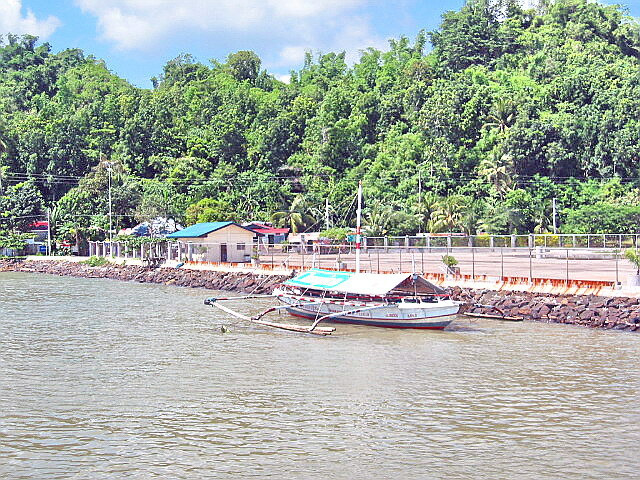 Our ship left Muelle Loney by 9:30 AM and the smooth crossing to the RO-RO port in Brgy. 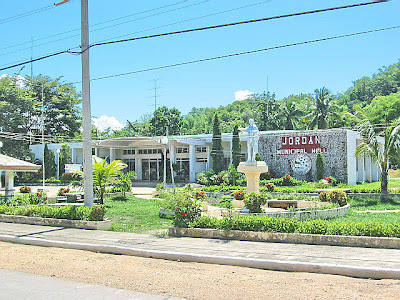 Hoskyn took just 30 mins.. Once docked, we drove off, with Charlie on the wheel, for Jordan town proper where we made a short stopover at the municipal hall and the town plaza, said to be the smallest in the country. From thereon, we proceeded on our GPS mapping around the island. At Nueva Valencia, we again made a short stopover at Raymen Beach Resort which was situated in a cove. 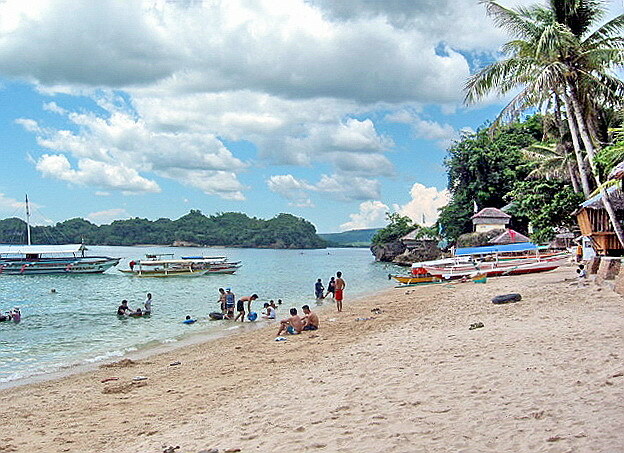 The narrow, beige sand beach was clean and the left side of the cove was a marine reserve with beautiful corals. The resort itself, considered the most popular win the province, is about an hour’s drive away from Jordan Wharf. It has a mix of airconditioned rooms with bath and TV and fan-cooled cottages with bath. They also have a canteen, billiards and videoke. Past Nueva Valencia, the road to Sibunag and San Lorenzo turned bad and I replaced Charlie at the wheel of the Ford Explorer for the second time in our 3-week GPS mapping expedition (the first time was from Kalibo to Iloilo City). Once done with our mapping, we returned to Jordan port and left on the 5:30 PM ferry. We were back in Fine Rock Hotel in time for dinner. F.F. Cruz Shipping Corp.: Lapuz, Iloilo City, Iloilo. Tel: (033) 337-1046, 336-9329 and 336-4195. F.F. 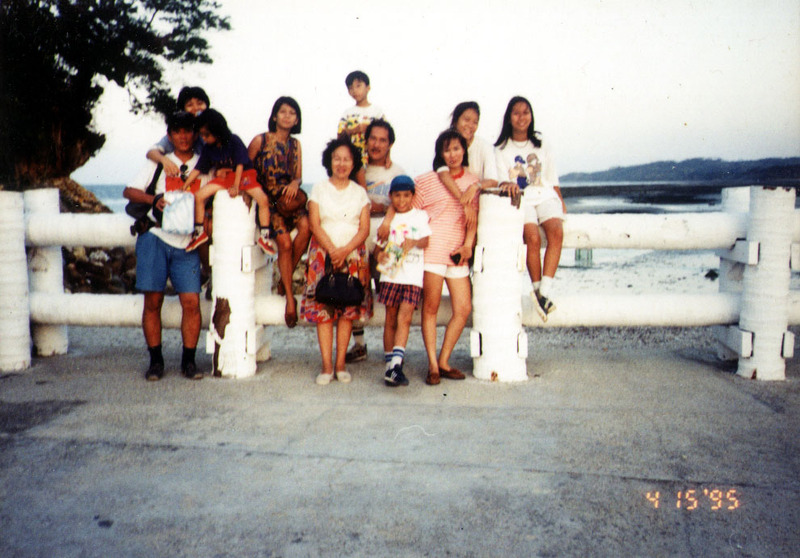 Cruz Shipping Corp.: Jordan, Guimaras. Tel: (033) 581-1701. 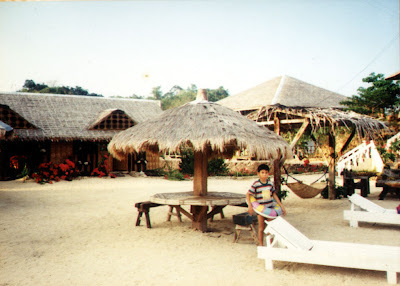 Raymen Beach Resort: Sitio Alubijod, Poblacion, Nueva Valencia, Guimaras. Tel: (033) 396-0252. 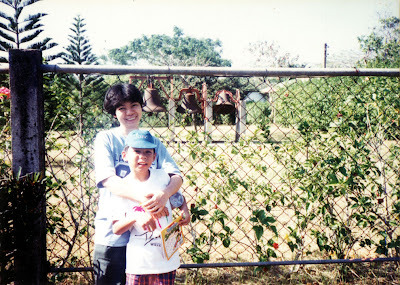 Our next stopover (3:30 PM) was at the Villa Fe Summer Resort, in Brgy. Old Poblacion, Buenavista, a 5-min. hike from the wharf. 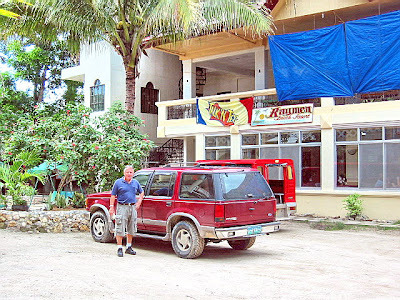 Frank and his family, together with a local guide, decided to go spelunking and explore the resort’s Daliran Cave, the most accessible cave in Guimaras, and its cold fresh water spring and stalactites. The rest, including me and my family, just waited outside. Inside, they got down and dirty with guano (bat droppings) as they communed with its denizens of the dark. Yuck! 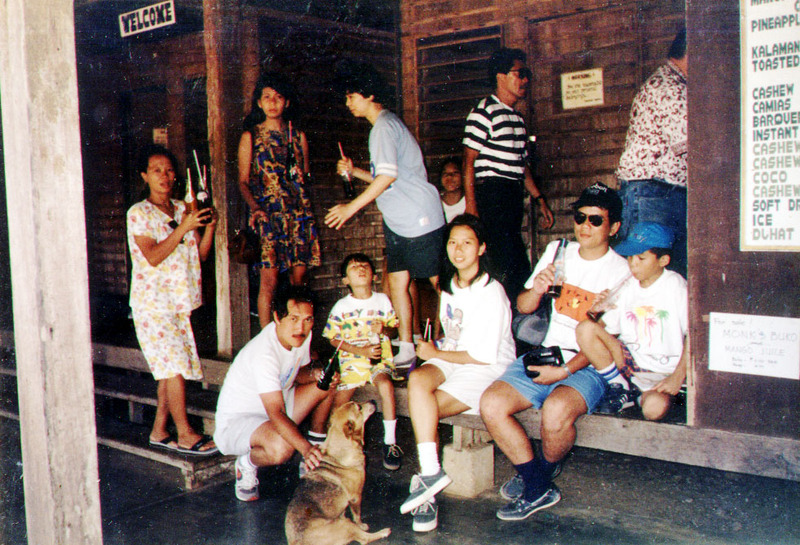 Our final sightseeing stop (5 PM) was Roca Encantada (Enchanted Rock), the summer vacation home of the Lopez family, one of the oldest grand clans of Iloilo and Guimaras. Emily Relucio Lopez was Guimaras’ first governor. We were allowed entry by the caretaker. 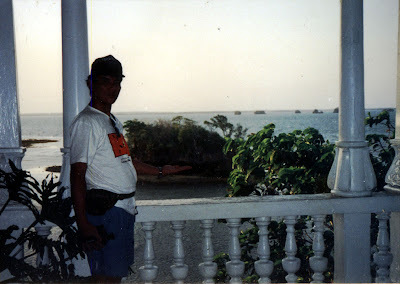 The mansion, accessed by a long flight of stairs, was built in 1910 by Presentacion Hofilena-Lopez on a promontory on one of 7 picturesque rock islets of the Siete Pecados (Seven Sins) Islands, in Brgy. Getulio. From its grand, spacious and airy balcony, we got a panoramic view of the beachfront, the Iloilo Strait and the 6 remaining islands. A lighthouse is situated on the largest islet. After lunch at the resort, we all availed of an afternoon sightseeing tour by jeepney. Our first stop (2 PM) was the Trappist Abbey. It was founded in 1972 and is the first and only one of its kind in the country and in the Orient. 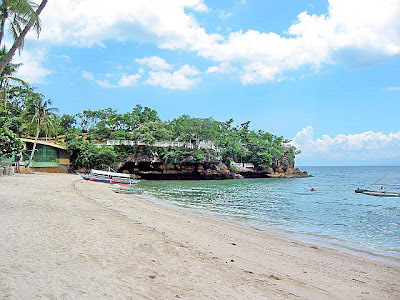 The Trappist (or Cisterians of the Most Strict Observance) monks, who called Guimaras the “Island of a Happy Man,” follow the rules of St. Benedict and all adhere to a vow of silence. They take care of the Aeta community through the Contemplative Outreach Program, grow Philippine lemon (kalamansi) and pioneer fruit processing in the province. We dropped by the monastery’s Gift Shop where religious items (crucifixes, prayer books, rosaries, etc.) and excellent processed food products such as jam, chutney, prunes, wines, marmalade, candies, ginger tea, cookies, piyaya and jelly (all made from mango, cashew, kamias, duhat, kalamansi and guava) are sold. Grace bought a small crucifix. We also bought some snacks and soft drinks. Grace, Jandy, Cheska and I also visited its small but quaint chapel. At the side of the walkway leading to the chapel are an array of 3 small bells. Trappist Abbey: Brgy. San Miguel, Jordan, Guimaras. Fax: (033) 581-3468. The morning of the next day, Good Friday, was spent on an island-hopping tour. 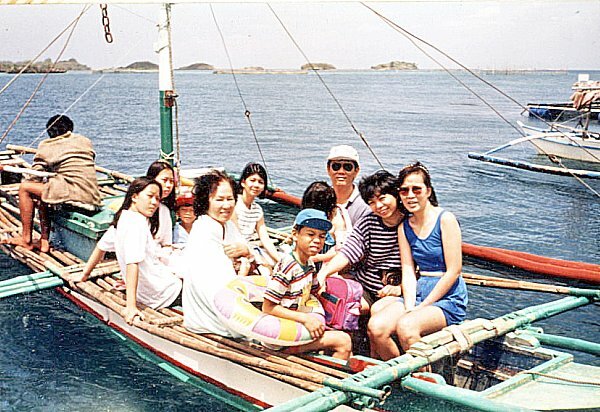 Some of the islands were the 2.5-hectare Isla Naburot (home to a eco-friendly resort owned by Alice and Ponciano “Pons” Saldana) and the 1,544 sq. 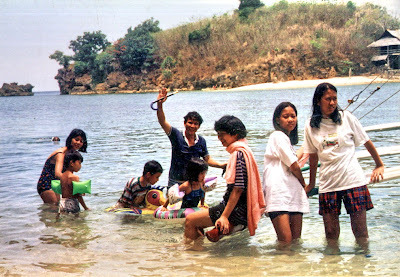 m. Tiniguiban Islet (where rare red shrimps make their appearance inside a pool during high tide). Past the latter is the highlight of our tour – the Igang Point Fisheries Research Station in Nueva Valencia, a government-run aquatic fishery center. Situated on a coral reef cove, it embraces 4 islands interconnected by floating bridges. This demonstration and training facility of the Southeast Asian Fisheries Development Center (SEAFDEC) promotes cage farming technology for marginal fishers. It is home to brood stocks of milkfish (bangus), giant grouper (lapu-lapu), sea bass, red snappers and other fishes in huge floating cages. In this cages, fishes mature and spawn spontaneously during the normal breeding seasons. Today, milkfish cultured in marine cages provides livelihood to 4 Nueva Valencia barangays (Igang, Magamay, San antonio and Sto. Domingo) affected by the major oil spill in 2006. They were given operational capital for the construction of fish cages. Income from the production runs was given to 5 organizations now operating cages on their own, with the assistance of SEAFDEC who taught villagers integrated culture and alternate day feeding to improve production. After lunch at the resort’s clubhouse, Jandy and I made a 20-min. hike, along well-marked concrete and dirt trails, past fishponds and Villa Igang, to sea-sculpted Igang Cave in Igang Bay. From a small opening, we waded its cool, crystal-clear and waist-deep waters, and emerged inside a large chamber with a rock platform with a great view of some islets and the western sky, where the sun sets. Taking a photo of the magnificent sunset and these islets, silhouetted by the cave’s opening, would have been a great shot. Too bad, I couldn’t wait for it. The late afternoon of the next day, Good Friday, Jandy and I hiked to Sacred Heart Hill (with its huge statue of Jesus Christ) as well as tried the alternative route to Igang Bay via a 30-min. crossing, over the murky waters of a mangrove forest, of a long and winding bamboo bridge where we observed, up close, these huge trees that are so essential for protecting marine life. 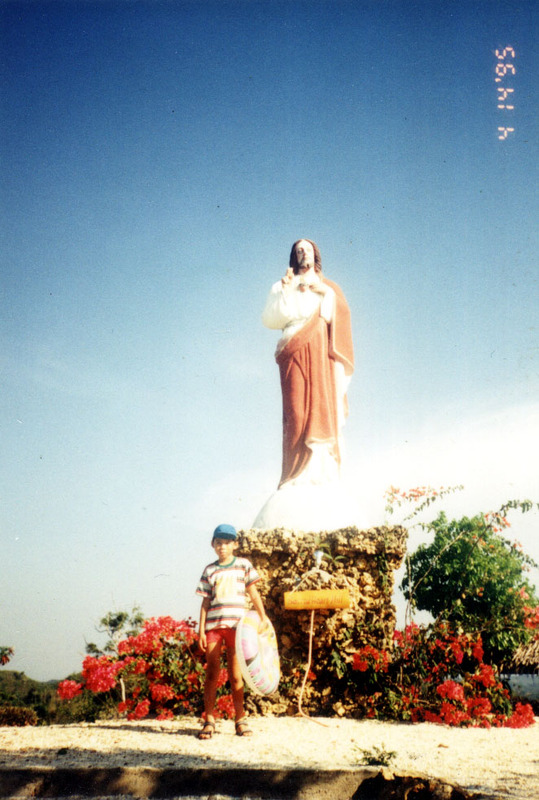 Also that day, the town was presenting the Ang Pagtaltal (meaning “to remove”), the Visayan version of the Oberammergau (South Bavaria, Germany) passion play whose final act is the scene where Jesus is taken off the cross and laid on his Mother’s lap. Too bad we didn’t watch it. 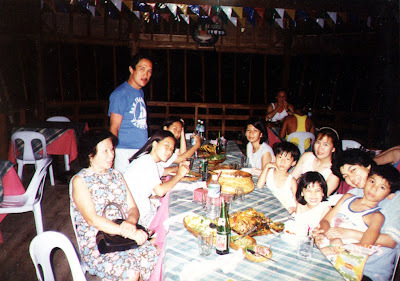 Holy Week of 1995 was Layug family reunion time we all opted to spend a 4-day vacation to a place we have never been to or rarely heard of – the 604.65 sq. 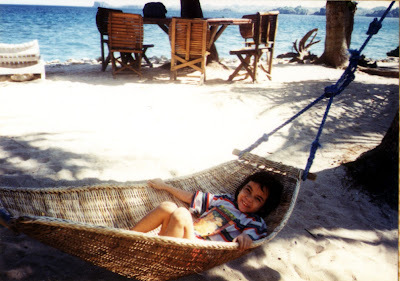 km., island province of Guimaras. 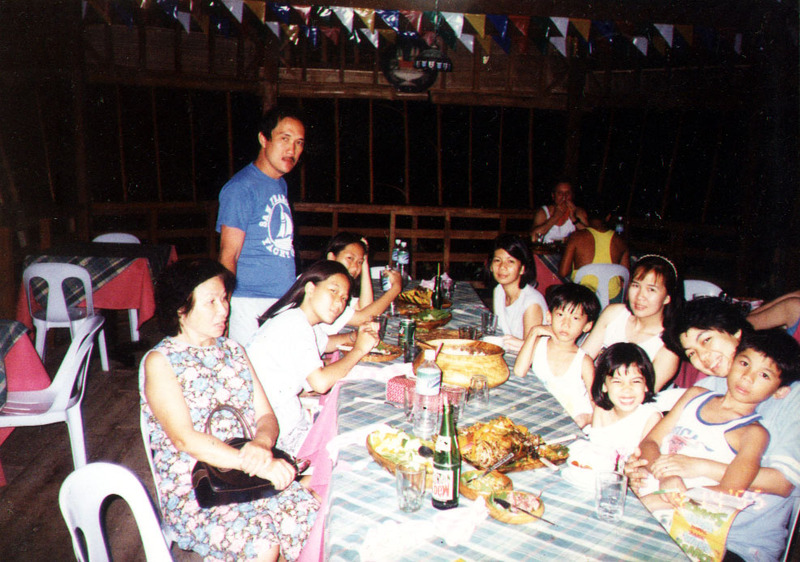 Me, Grace and our kids, 9-year old Jandy and 4-year old Cheska, as well as my mom Carol, our eldest Frank, together with wife Cherry, daughters Jaja and Sandy and son Franco, and our youngest sister Tellie were joining. However, my older sister Salve wasn’t able to join us. We left Manila on April 13, Holy Thursday, on the 4:30 AM PAL flight from Manila to Iloilo City arriving at the Mandurriao airport by 6:30 AM. 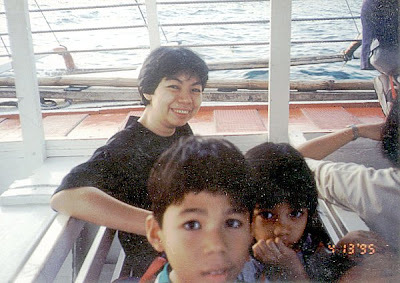 At the airport, we were picked up by a shuttle which brought us to the city’s Muelle Loney Wharf near the Post Office. Directly offshore from Muelle Loney, separated by the 1.5-nautical mile wide Iloilo Strait, is Guimaras Island. 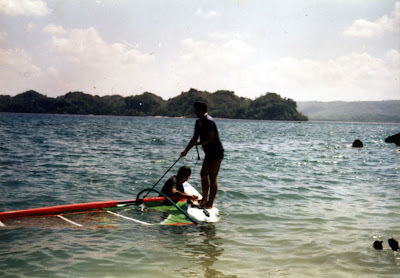 Here we boarded a big outrigger boat which brought us to our destination – the Class “A” Puerto del Mar Resort, along Alubijod Bay in Brgy. Sta. Ana, Nueva Valencia, arriving at the resort by 8:30 AM. Breakfast was already being served at its restaurant and we had our first taste of the island’s famous mangoes (8,000 hectares or about 20% of the province is mango orchards). We were billeted at 3 of the resort’s non-airconditioned native-style beachfront cottages with bath. 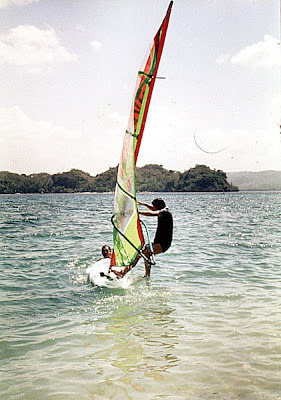 The resort also has a private beige sand beach, picnic coves, an aqua sports club (windsurfing and snorkeling), pavilion, bamboo bridge and serves as a training center for a local maritime school.